After flying all day back from Rome, I was due in Washington for a two day meeting. I’ve found that avoiding the HOV restrictions in Washington requires either staying in the city the night before or driving in insanely early. This time, I chose to stay close to the city at the Hotel Monaco in Alexandria, VA.
Hotel Monaco is a Kimpton, and you already know how I feel about that chain. I’m pleased to report that the staff at the Monaco is excellent, interactive, and mostly informed. 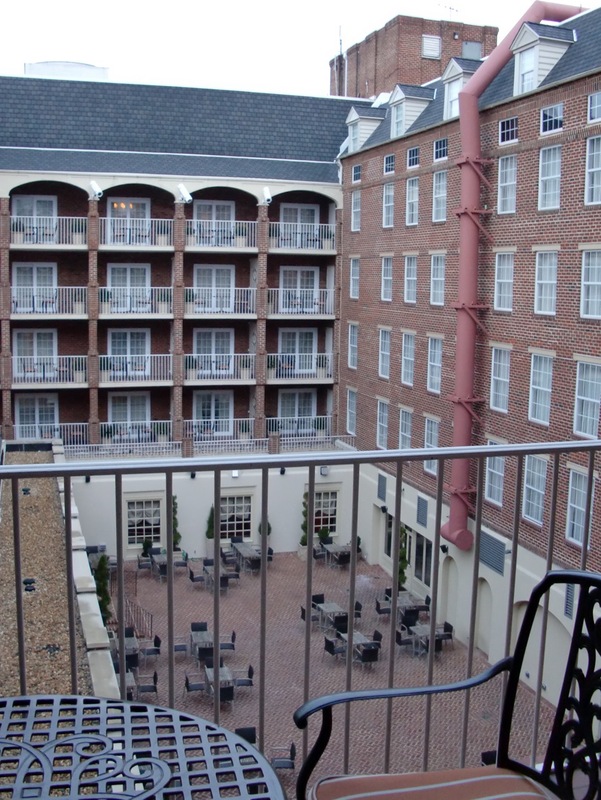 I recommend the rooms with balconies that overlook the internal courtyard. Here’s the view from room 447. 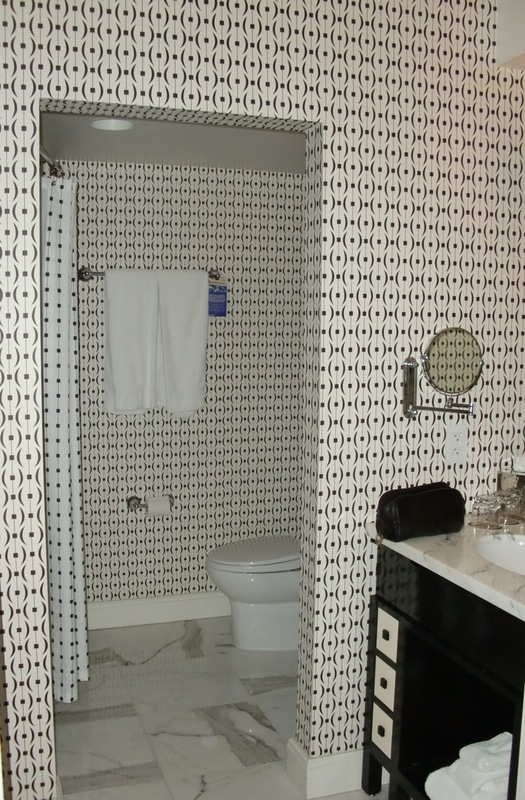 Bathrooms are fairly standard as far as Kimptons go. Nice marble shower over a heavy duty tub in the case of the Monaco. The shower I took after 10 hours in a plane felt great. The wallpaper actually looks slightly spiffier in person than it does in these pictures. Very tasteful. 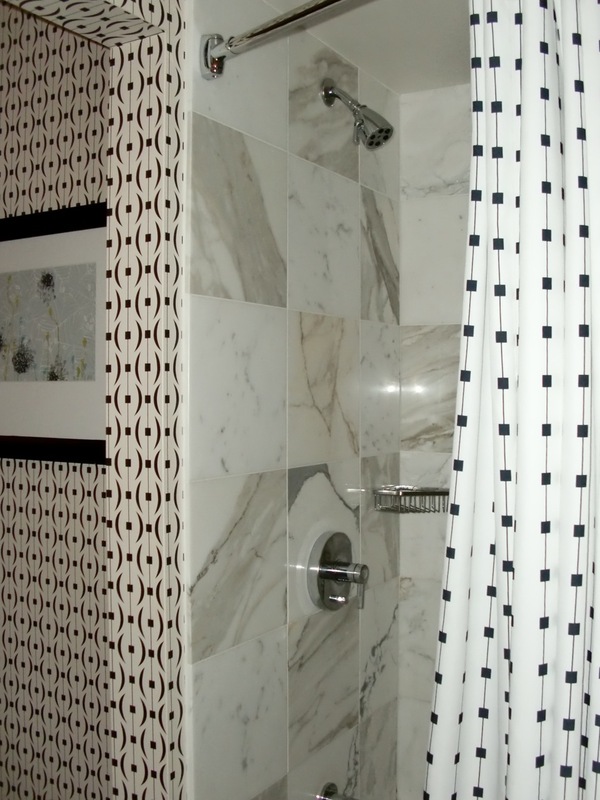 On the strength of its staff, the Hotel Monaco earns a five showerheads rating. I’ve stayed here before and I will stay here again. Mixology-wise, Alexandria has a superb mixologist at the Restaurant Eve bar where they make a majority of their own ingredients. Also the bartender at the Majestic Cafe is very good and knowledgeable. He turned me on to Leopolds Gin which is made in Virginia.